The film genuinely villainizes meat eaters and those who would kill or injure animals for the sake of food or other products. However, It’s far from a scathing indictment on those who would eat meat, it also doesn’t necessarily side with the animal rights activists. Bong presents both sides as over-the-top extremes with good intentions, but questionable methods. Generally speaking, the main character stays neutral, but accepts help in accomplishing her goals when it’s offered. That main character is Mija (Seo-Hyun Ahn), a young girl living on a farm in the hills of South Korea. The film’s opening introduces the Mirando company - lead by Tilda Swinton’s CEO Lucy Mirando - and their plan to breed a large number of super pigs the size of hippos. The best, most photogenic of them will be distributed around the world to be raised by local farmers before the company reclaims them. After that, they’ll be shown off during a parade and then, of course, killed for their meat. 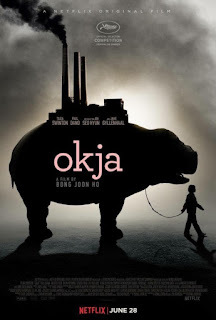 Mija spends most of the film trying to find a way to get Okja back after they steal her away from their farm. The obvious conflict presented is the moral ambiguity in solving the problem of world hunger by cruelly murdering intelligent animals. Bong Joon-ho does a good job of establishing Okja as a highly intelligent and lovable animal with a strong relationship to Mija. Okja isn’t just a dumb farm animal, she’s the family pet. Mija and Okja have grown up together, and they look out for each other. As if to further justify the troublesome journey Mija eventually finds herself on, Okja also selflessly injures herself to save Mija from falling off a ledge after accidentally slipping on some loose gravel while playing. Nevertheless, Bong Joon-ho gives us a simple, very idyllic image of life on the farm with Okja. It’s easily the best sequence in the film. It plays much like a live-action version of a Miyazaki film. Perhaps that’s why a lot of the rest the film feels so miscalculated. There’s a lot of ideas going on here, both stylistically and story related, but they don’t all come together in satisfying ways. The corporate satire, the genetically modified food, the caricature of the animal expert TV host, and even the animal rights activists all come off a little too over-the-top. Worse yet, I’m not sure the film actually has much to say about them. About the only thing that works is the film’s firm stance against animal cruelty. In fact, the final scenes are so effective they have many considering a switch to vegetarianism. The film even highlights humanity’s inconsistent stance on the treatment of animals. Some are considered off limits when it comes to food. In America we don’t eat dogs, cats, horses, dolphins, or other creatures we perceive to have higher intelligence - though they’re likely eaten in other parts of the world. Yet farm animals are considered fair game, provided they’re not mistreated before they’re killed. I suppose if Okja succeeds in one thing, it’s starting a conversation around these thought provoking issues. Yet Bong’s trademark combination of thought provoking issues presented with a somewhat light-hearted comedic tone doesn’t really work here. The comedic, over-the-top tone tends to conflict with this peculiar world rather than enhance it. Many of the performances are such over-the-top caricatures that they come off as goofy. The most talked about, and disagreed about, performance tends to be that of Jake Gyllenhaal’s TV animal expert. It’s such an over-the-top caricature that I can’t fathom it working for anyone. Yet Tilda Swinton and Paul Dano are only marginally better. Everyone else seems to have been directed as though they were in a far more serious film. I can’t help wondering if the film’s primary themes would have been more easily accepted had they not clashed against such inconsistent tones. They also present the issue of who this film is for. It’s a Korean/American, straight-to-Netflix production that seems in just about every way to indicate that it’s for kids. From the over-the-top characters, to the young girl and her giant beast at the center of the film - that would seem to put this in the same genre as E.T., Pete’s Dragon or The BFG - you’d think this would be a good film for family movie night. However, there is enough bad language and disturbing scenes that I imagine it being quite horrifying for a younger audience. I give Bong Joon-ho a lot of credit for his bold choices, and Okja is nothing if not one bold choice after another, but it simply doesn’t work.